A show this spring at the State Theatre will share personal stories of experiences with mental illness, and community members are invited to audition to participate. 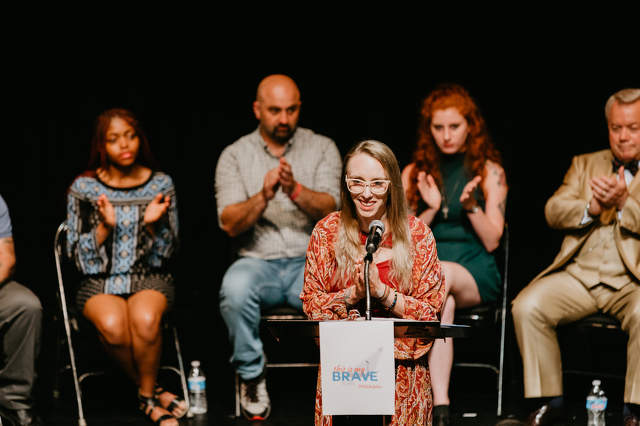 Since 2012, the nonprofit This Is My Brave has been dedicated to opening a dialogue through storytelling performances and ending discrimination against people living with mental issues. Last summer, two local residents — Shawn Henfling, of Bellefonte, and Skylar Dawn, of State College — were in the cast of a production Philadelphia, sharing their their own stories of bravery, recovery and hope. "It is profound. It is very much a life-changing experience," Henfling said. "Just at our first rehearsal we both already knew this is something we wanted to bring to State College. Being in the same room and listening to people talk about things they might not ever have actually verbalized before was incredible." This Is My Brave shares stories in a variety of ways, such as spoken essays, poetry, skits and songs. Auditions are scheduled for Jan. 19 and 20 and can be scheduled online here. The local show will take place on April 26. Individual performances are about three to four minutes and Henfling said auditions are "very low-key" and as comfortable as possible, taking place only in front of him and Dawn. "You want to keep it three or four minutes and be true, but have a message of hope," Henfling said. "The other thing we do is we ask people to avoid words that may be too gruesome or detailed. If you had a suicide attempt, we ask that you not go into the attempt in detail. We don’t want someone to come out of the show traumatized. We want them to feel the pain and the hope, but not go down the rabbit hole." Henfling and Dawn are looking to cast about a dozen people from different backgrounds for the show. "We want people from all walks of life to show this is not just one subset of the population that experiences it," he said. Henfling, a professional photographer, has long been a writer about mental health issues and is very involved in local efforts. He is a member of the Centre County Suicide Prevention Task Force and the Mental Health/Intellectual Disabilities/Early Intervention & Drug and Alcohol Advisory Board. He also is involved in the county Zero Suicide initiative and local American Foundation for Suicide Prevention chapter, and is a volunteer for Centre Helps. Through his work as a mental health writer, he became acquainted with This Is My Brave co-founder Jennifer Marshall. A friend, meanwhile, co-produced a New York City show and encouraged him to audition for the Philadelphia performance. It was not only the show that was a rewarding experience, he said. Afterwards, as he and other cast members went out to the lobby to meet friends and family, they found much of the audience had stayed. "They wanted to tell us how our stories touched them, and share stories of their own," Henfling said. Among the cast were two people in their late teens who shared how they faced anxiety and depression during their adolescence, and that particularly connected with younger audience members. "For those teenagers that were in the audience, some were in tears and wanted to thank people for sharing their stories and talking about it," he said. As they undertake producing and fundraising for the show, Henfling and Dawn have a few goals for the performance. They hope to connect audience members with the many local resources that are available, and those organizations will have staffed tables in the State Theatre lobby. They also want everyone to know that it's OK to talk about mental illness. "For me, I went a long time ashamed that I couldn’t just fix myself, think my way out of the hole. I know that’s not uncommon," Henfling said. And they want to encourage those in need to get help while increasing understanding among those who might not experience mental illness themselves. "We’re not broken. We’re just sick," Henfling said. "It hopefully will make the audience aware that if they don’t have mental illness that this is way more common than you think. Your family member, friend or neighbor is not doing it for attention or for the drama. They really do need help. We need to talk about it and make it OK to get help." The State College performance will add to the growing expansion of This Is My Brave performances. It started out in Northern Virginia, but last year alone had shows all across the United States and one in Australia. As producers of the local show, Henfling and Dawn also will help the cast to craft their messages and be comfortable telling their story to an audience. Their work is all a part of spreading hope for those who are struggling with mental health issues. "At its core, This Is My Brave is a safe place for people with experience with mental health problems to share their stories," Henfling said. "The focus is on hope. It’s centered on ‘Hey, it does get better.’"